Successful democracies rely on an active citizenry. They require citizens to participate by voting, serving on juries, and running for office. But what happens when those citizens purposefully opt out of politics? Exit—the act of leaving—is often thought of as purely instinctual, a part of the human “fight or flight” response, or, alternatively, motivated by an anti participatory, self-centered impulse. 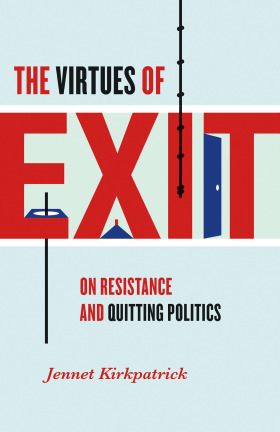 However, in this eye-opening book, Jennet Kirkpatrick argues that the concept of exit deserves closer scrutiny. She names and examines several examples of political withdrawal, from Thoreau decamping to Walden to slaves fleeing to the North before the Civil War. In doing so, Kirkpatrick not only explores what happens when people make the decision to remove themselves but also expands our understanding of exit as a political act, illustrating how political systems change in the aftermath of actual or threatened departure. Moreover, she reframes the decision to refuse to play along—whether as a fugitive slave, a dissident who is exiled but whose influence remains, or a government in exile—as one that shapes political discourse, historically and today.